Brandon Findlay recently blogged here about “good research and total synthesis” Well here is something I hope he will enjoy. Very recently he published a JOC perspective in which he outlined his philosophy towards natural product synthesis with a myriad of examples of his own work1. I would like to try and give you all a flavor of his approach here. Amongst other things Prof. Hanessian is probably well known for his propagation of “The Chiron Approach” to organic synthesis2-6. A chiron is a combination of the words chiral and synthon and represents a small chiral building block, for example, amino acids, terpenes, carbohydrates. 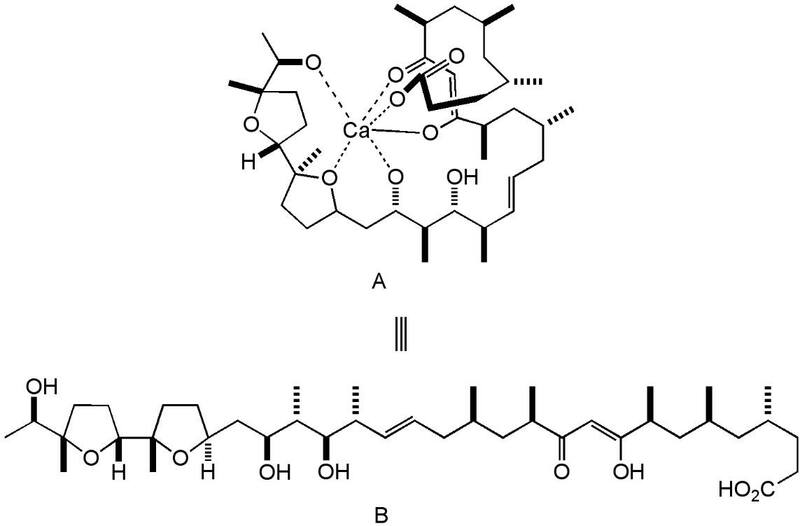 This gave rise to an excellent computer assisted synthesis program that recognised these chirons in a complex molecule and suggested synthetic routes. I have used this program personally and found it very helpful for the problem I had at the time. This whole approach is based upon a “visual relational thought process” which is a vital part in the planning and conception of the synthesis of a complex molecule. Let us examine just some of the extensive number of examples given by Prof. Hanessian in his perspective one, for example, Ionomycin. The calcium salt of this compound is the folded structure A and looks quite complicated, when one “unfolds it” to a linear sequence, compound B, the stereochemical perspective is much more recognisable, however still a very complex molecule. With a good knowledge of organic chemistry and what one can do experimentally, Professor Hanessian reduced compound B to simple chirons, one of which is glutamic acid a simple cheap readily available chiral starting material. This was then converted to some more advanced intermediates en-route to Ionomycin. 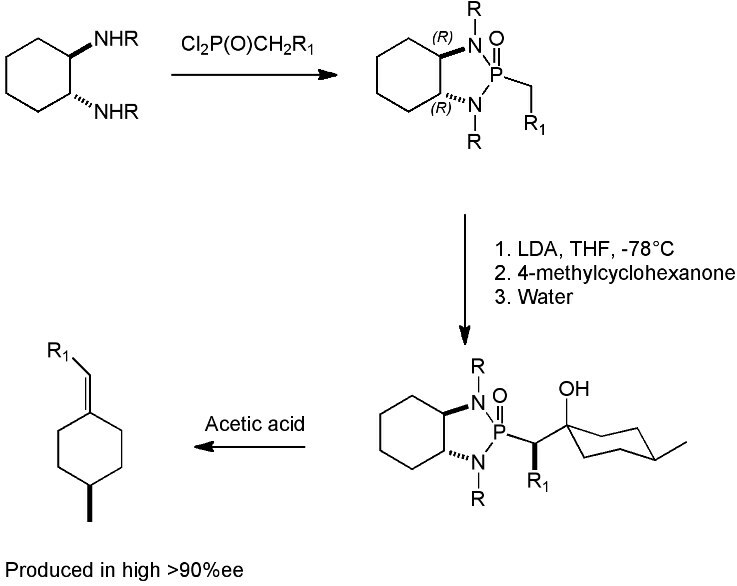 It would have taken me a long time to get to glutamic acid as a starting material for the synthesis of this compound. Chiral C2-symmetric phosphonamides are also a significant part of Prof. Hanessian’s contribution to organic chemistry7,8. These compounds are single diastereoisomers where attack of an electrophile occurs from the less hindered side of the anion. Further reaction, in this variant of the Horner-Emmons, reaction leads to the chiral olefins in good yield and high enantiomeric excess. He is still working hard as judged by his latest publication in Organic Letters9, which I can recommend. I collaborated with Professor Hanessian for many many years during my industrial sojourn. I always enjoyed his visits to the company; not only for the good food and wine we were presented with but for the stimulating chemical discussions and the new perspectives that he brought to a problem. He made us think and he always enjoyed a lively discussion. Congratulations again on your recognition Stephen. Hanessian, S.; Giroux, S.; Merner, B. L.;Design and Strategy in Organic Synthesis: From the Chiron Approach to Catalysis; Wiley-VCH: Weinheim, 2012. Hanessian, S.; Franco, J.; Larouche, B. Pure Appl. Chem. 1990, 62, 1887. Hanessian, S. Reflections on the Total Synthesis of Natural Products: Art, Craft, Logic, and the Chiron Approach. Pure. Appl. Chem., 1993, 65, 1189. Hanessian, S. Design and Implementation of Tactically Novel Strategies for Stereochemical Control Using the Chiron Approach. Aldrichimica Acta 1989, 22, 3. Hanessian, S. Total Synthesis of Natural Products: The “Chiron Approach”; Pergamon: Oxford, 1984. Hanessian, S.; Delorme, D.; Beaudoin, S.; Leblanc, Y. J. Am. Chem. Soc. 1984, 106, 5754. Bennani, Y. L.; Hanessian, S. Chem. Rev. 1997, 97, 3161. Hanessian S., Chénard E., Org. Lett., 2012, 14(12), 3222-3225. Prof. Hanessian’s work is quite impressive. A fair bit of my PhD has revolved around aminoglycosides, and he has made a number of significant contributions to that field (a current clinical candidate, Achaogen’s Plazomicin, seems to owe a fair bit to chemistry the Hanessian lab developed). I study at Université de Montréal, and we used CAM many times in undergrab Org.Chem labs (as must most organic chemists). We were never told that Prof. Hanessian had created the formulation. It would have been a nice for someone to tell us.